“Have you figured it out yet?” Zander Tallman asked as he bounced from table to table filled with people playing complicated board games at Just Games, his hobby shop on Main Street in Lexington. The store stocks more than 500 party, dueling, cooperative, strategic and classic games designed for players looking to conquer the galaxy in a three-hour battle or just have some laughs. With his store, Tallman is taking a calculated risk in a town the size of Lexington. He said hobby game shops are typically found in larger cities, at least the size of Harrisonburg. Just Games has a unique business model. The store lets people try out board and card games to see if they like them enough to buy. Tallman said he doesn’t know if his model will work or if his business will survive in a 7,000-person town, but the store’s holiday sales met expectations. Four months ago, Tallman, 26, opened Just Games with his wife, Paige Gance. The Washington and Lee University alumni moved back to Lexington after Tallman earned a master’s degree in accounting and worked in Washington as an auditor for a year. The store operates on the south side of Main Street in The Hub, a 4,400-square-foot space that was transformed into the game store, a fitness studio and a bike shop. The building was once an indoor mini-golf course next to the Stonewall Jackson Memorial Cemetery. The Hub is a symbiotic space. A customer who comes into one store may end up going to all three, Tallman said. Having Just Games, fLEX Fitness and Red Newt Bikes in the same building limits competition because the three businesses are unique. Tallman said he decided to pursue his passion when he heard of Launch Lex, a program in which participants learned how to run a small business and competed for grant money. A group of regional entrepreneurs and economic experts judged the final Launch Lex Pitch Competition in April. All three stores competed in the Launch Lex competition. But of the three, only Just Games won $10,000 in grant money. Red Newt Bikes and fLEX Fitness decided to open anyway. Goodin said the viability of the business plan is what helped Just Games win. Tallman and Gance host gaming events at the store almost every day of the week for anyone who is interested in learning games and meeting new people. He said turnout has been encouraging. The shop’s after-school club has been especially popular among teenagers. 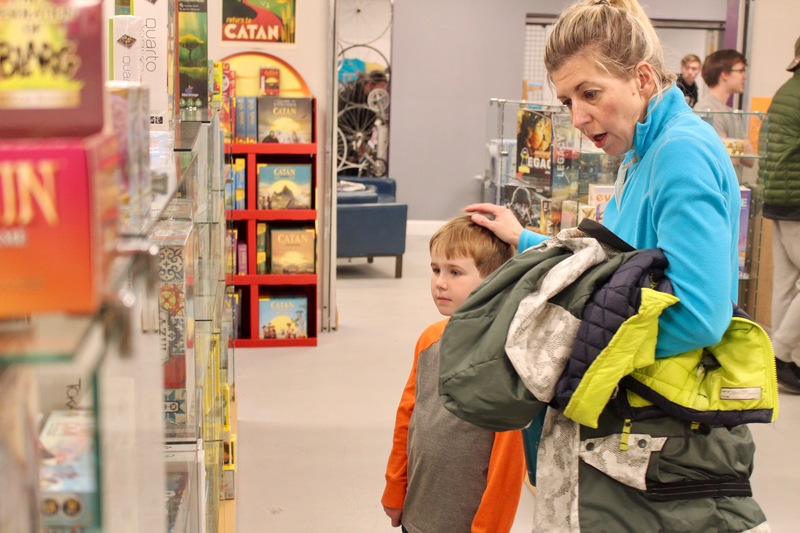 “We’ve had several parents say they are really glad we’re open because their kids are opening up and finding things that they like and come home passionate about something,” Tallman said. But how successful can a niche store be in a small town? 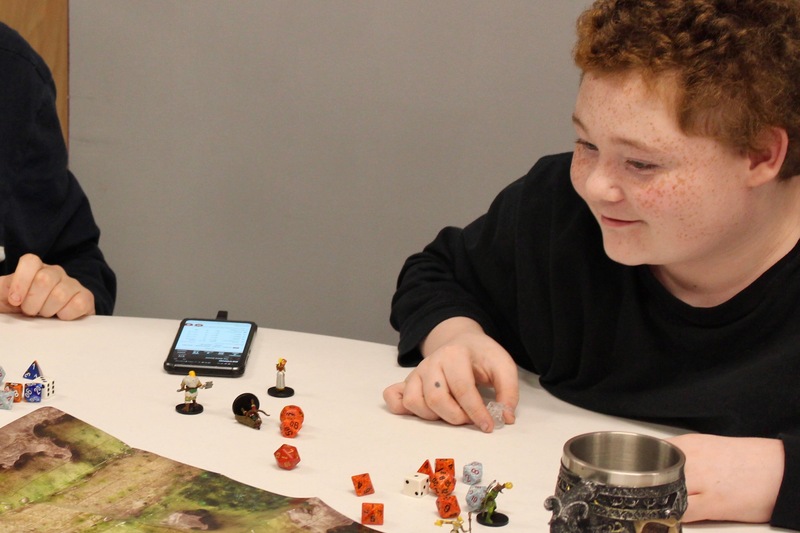 Hobby game sales in North America have doubled in the last four years to top $1.5 billion, according to ICv2, a market research group that keeps track of “geek culture business.” Popularity for board and card games is rising among young adults. With two colleges, Lexington has a median age of just over 22. It is the youngest locality in the United States as of 2015, according to the U.S. Census Bureau. Market research suggests a game store in a town with a lot of young people should be profitable. But Goodin said the internet is a source of serious competition for any local store. Just Games stays open beyond normal business hours—typically past its posted 9 p.m. closing time Wednesday through Friday. Main Street Lexington Executive Director Rebecca Logan said that’s what makes it stand out. Southern Virginia University graduate Justin Wiseman said he and his friends play games several nights a week until the store closes. Just Games fans like Wiseman and Blake Shester, a father and avid board-gamer, make regular purchases. Gance said she is encouraged because some customers have come into the store with their relatives’ “Amazon wish lists,” saying they would rather buy local than online. Tallman said he is not focused on getting rich.